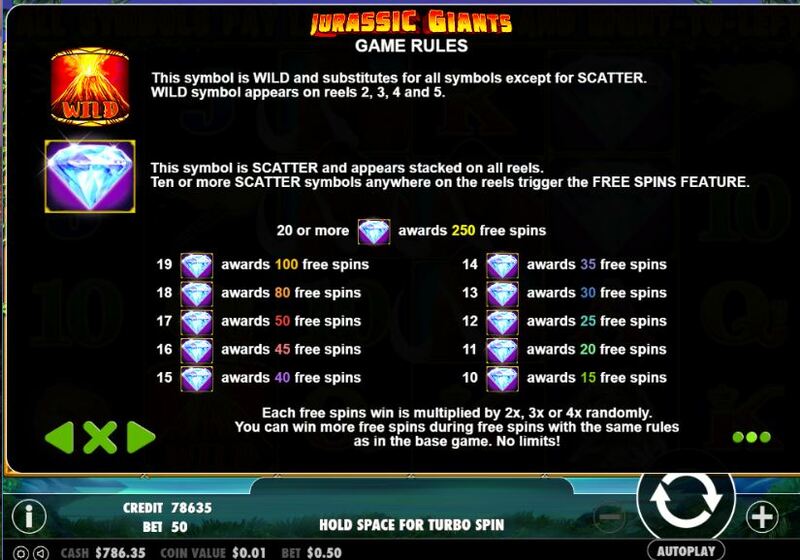 Jurassic Giants slot is simply a fantastic improvement on the 4096-way format so popularized by Raging Rhino from WMS and Buffalo Blitz from Playtech. 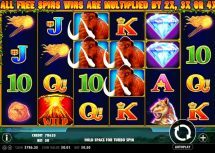 We dispense with the wild multipliers in the free games although they still appear singly on the centre 4 reels, but the best 6-of-a-kind win pays 8x as opposed to 7.5x for the Rhino and even better, we get both-way pays so wins can be awarded from right-to-left too! The symbols can all appear stacked up to 3 rows high on this game of 4 rows and 6 reels and the T-Rex is the top one at the aforementioned 8x stake for a full way. There is even more good news – as with Rhino we need diamonds to trigger the free games but these appear fully stacked 4 rows in height on all reels and you need 10 in view to trigger 15 free games. If you get 19 you will be awarded a staggering 100 free games and if 20 or more land an insane 250 free spins! They can be retriggered in the same way. Now we don’t see the Wild multipliers as with Rhino and Thunderhorn but that’s good as we don’t need them, because every win will have a random multiplier displayed above the middle reels of either 2, 3 or 4x. 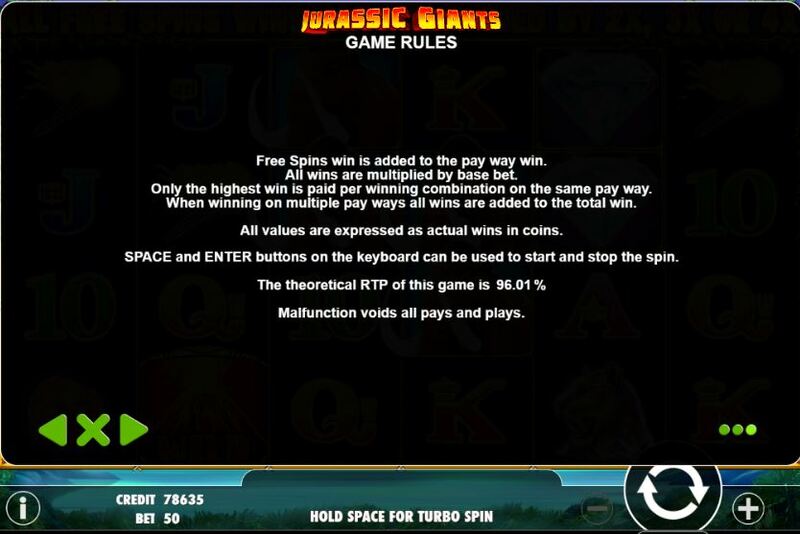 Jurassic giants slot has big potential in the base game and absolutely mad potential in the free games. No bonus guarantee here, but one shouldn’t need it with a minimum of 15 free games to be played. 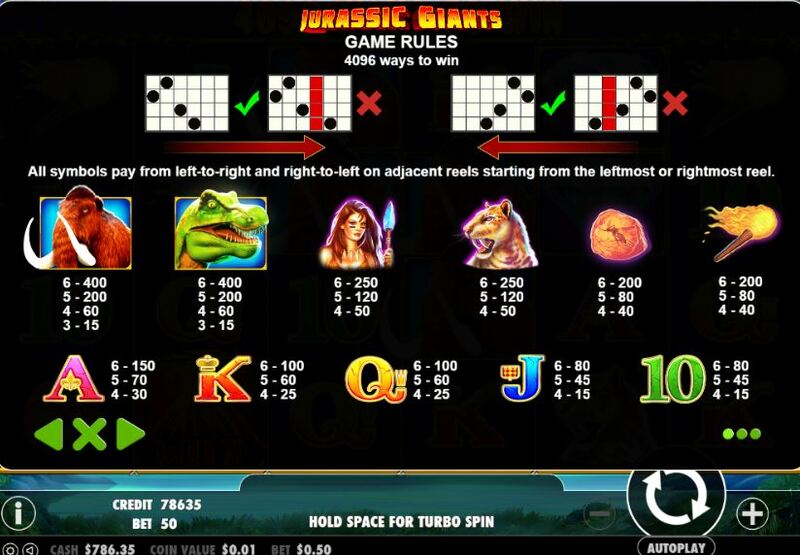 Jurassic Giants is a quite extraordinary slot but like all high-volatility games bring a decent balance on board and unlike the other comparable slots mentioned above which are 40 coins to play, Jurassic Giants requires a 50-coin stake. The RTP is better than those too, at 96.03%. Go and enjoy this game if it’s a your casino!